Chocolate Sour Cream Cupcakes were inspired by some cupcakes I saw at Crumbs bakery. If you are familiar with Crumbs (and who isn’t? ), their cupcakes have high tops thanks to heaps of frosting. While my version does have a good deal of frosting, I focused on making cupcakes that dome nicely so that the frosting could easily be smoothed into a tall, rounded appearance. The cake part of this recipe is adapted from “The Only Bake Sale Cupcake You’ll Ever Need” and the icing is adapted from Oprah.com. I halved both recipes, added vanilla, and baked the cupcakes at a higher temperature since I’d read that domed tops were formed from high heat baking. It seems to have worked. The domes are just the right size and shape for building up with more icing for a big, dramatic top. Additionally, the icing has a pretty strong (in a good way) sour cream flavor and a velvety smooth, non-chalky texture. It goes really well this this particular chocolate cake. And finally, if you only need 6 cupcakes, you can halve this recipe. Just beat the egg lightly and measure out a little less than 2 tablespoons. Let me know what you think of these High Top Chocolate Sour Cream Cupcakes! Preheat oven to 375 degrees F. and line 10-12 muffins cups with paper liners. I wanted my cupcakes to be a little bigger, so only used 10. Melt the chocolate in a bowl set over hot water or in microwave. Set aside to cool slightly. Mix the sugar, flour, baking soda and salt together in a mixing bowl. Whisk the coffee, sour cream, oil and vanilla together in a separate bowl until very well mixed. Gradually add the coffee mixture to the flour mixture, stirring to blend, then add the egg and whisk until combined. Add the melted chocolate and mix until it’s blended in. 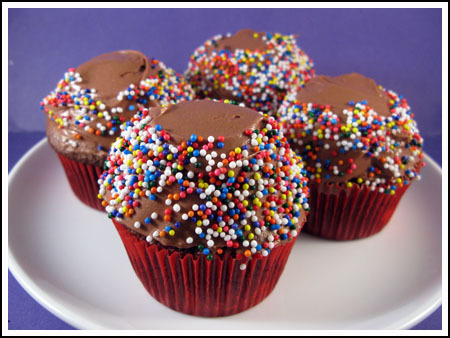 Divide the batter evenly between the cupcake liners and bake on center rack for 20 minutes or until cupcakes appear done or a toothpick inserted in the center comes out with moist crumbs. To make the frosting, melt the bittersweet chocolate and set it aside to cool to lukewarm. Beat the butter with an electric mixer until fluffy. Beat in the powdered sugar, salt and vanilla. Stir in the melted chocolate and the sour cream. We’re having some friends over to watch the UT game and the meal theme is ‘finger foods’, so I’m going to make these for dessert! That frosting looks incredible. Could you use semi sweet chocolate in place of the bittersweet or does it have to be bittersweet? Also what is the dome made out of? I just wanted to let you know I just made this recipe for a neighborhood adult potluck. Added some instant coffee powder to the batter and frosting to make it more mocha and they’re sooooo delicious. Never tried a dissapointing recipe from this blog yet, but this one is the best cupcake recipe that I’ve ever personally made. Thanks so much! Thanks for the feedback! It’s a good, basic recipe. I wasn’t sure how much frosting the Oprah recipe would yield, so I went with the better safe than sorry approach and made too much. I have some leftover too. Made these yesterday for our church youth group. The teens highly highly approved!! A note: The cupcake recipe will make 10-12, but the frosting will frost about 20 cupcakes. 🙂 Having extra frosting is always a good thing in my book!! Love the new look!!!! What a fun surprise for your readers today! 🙂 I’m making these cupcakes today for sure!!! Marie, let me know if it works. You’ll probably get a little bit of a bump, but I don’t know…. Wow, those look great! The sprinkles are a cute touch. I’ll let you know if I try it. This has given me new inspiration re: my dad’s sixty-mmph birthday on the 18th. We ALWAYS make chocolate sour cream cake for his birthday, and I’m thinking maybe chocolate sour cream cupcakes this year? By the way, love the new look of your blog!! Yikes, new format! I kept thinking I had logged in wrong;-) Like it…thanks for all the tempting and delicious looking recipes!!! Thanks for the comments on the new look! I need to come up with a new banner, though. The current one doesn’t fit the “Madness” theme. I’m learning all this as I go — Php, CSS, Photoshop. It’s almost as fun as baking. About cupcakes, I was reading Food & Wine’s website this morning and found a very similar cupcake recipe with a cookies and cream flavored frosting. The batter is almost the same as this one, but for the fat they use 1/4 cups butter and for the 2 oz chocolate, they use 6 tablespoons cocoa and and add in 1/4 cup vegetable oil to make up for the fat missing from the chocolate. And since they use a little more vegetable oil than needed to make up for the fat in the chocolate, they use buttermilk in place of sour cream. I may make a batch of those for the kids across the street. Love the new look, and these cupcakes 😉 They look so yummy, is only this humidity would break I could turn the oven on! AH! I’ve been looking for a good, easy chocolate cupcake recipe. FYI: the chocolate frosting recipe on the can of Ghiradelli’s unsweetened cocoa is TO.DIE.FOR! I love your new template- very clean & neat! whose theme is Come on over Cupcake. These would be so perfect! Thanks Anna…perfect timing for me! Well, there is a pile of frosting but it is spread over the dome. The dome just bulks it up a little and gives it a good shape. So that really isn’t a pile of frosting on top of the cupcakes? Love the high tops Anna! Smart thinking on raising the temperature! Oh, these look yummy! I’m bookmarking this one! Thanks!